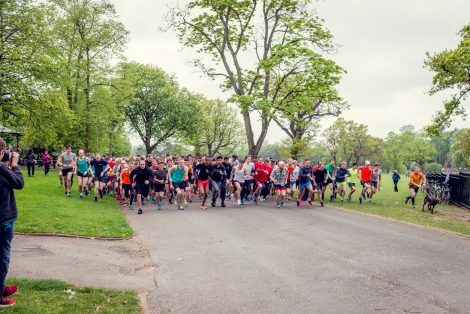 parkrun (yes that’s a small p; #allonewordalwayslowercase) started life in 2004 as the Bushy Park Time Trial, with just 13 runners taking part in the first event. Now in 15 countries, with over a thousand events and more than two million registered runners* the parkrun phenomenon is based on a very simple concept – you register once, print your barcode, then turn up to run (or walk, or volunteer) at one of the free, timed 5k events every Saturday morning (or for juniors there are 2k events on a Sunday). Your time is recorded as you cross the finish line, then you’re given a token which corresponds to your finishing position, which is scanned along with your barcode by one of the volunteers. Later that day you get a text and/or email with your result. It all works well (most of the time) as long as you stay in your finishing order once you cross the line (until you have your token) and of course, Don’t Forget Your Barcode (DFYB)! parkrun is all about inclusivity, which is why there are no winners (although you can be a first finisher! ), no cut-off times, and it’s always described as “a run not a race” (no-one needs to know that as a middle-aged woman you’re always ‘racing’ that 12-year old boy in a Villa shirt… unless you let it slip of course!) You can have an easy run one week, strive for a PB (personal best) the next week or pace a friend… it’s your parkrun! Once you’ve started parkrunning it can become a bit addictive as you strive first for your 50-club t-shirt (or 10 for juniors) and then your 100, 250 and 500-clubs, or don the high-vis 25 times for a volunteer club t-shirt. 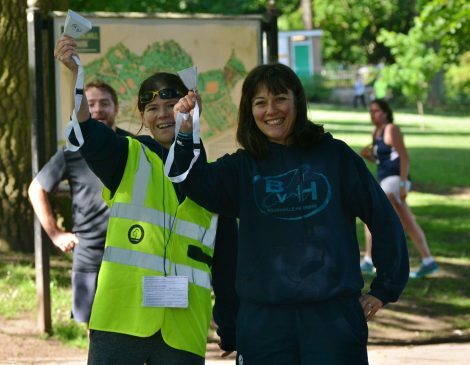 parkruns (and junior parkruns) rely on volunteers; the marshals, timers, funnel managers, tail-walkers and event team that make the events happen every single week. If you’ve never volunteered before do give it a go; it’s so much fun to see all the runners, from the super fast to the families, walkers and first-timers. You also get a great insight into everything that happens behind the scenes. Wearing your club kit to Cannon Hill or another local parkrun you get a lot of support. Lots of our members first heard of BvH through seeing us at parkrun (or in my case through volunteering and chatting to an existing member). We also regularly organise parkrun tourism and celebrate our milestones and PBs together. complete with volunteers in high-vis jackets. with one eye on their well-worn Garmins. to stretches, clapping and a removal of layers. There’s a drifting towards the start line. gather and become the spectators. a children’s playground, sculptured hedges. Encouragement seeps from every tree. and check times as they filter down the funnel. of placing one foot in front of the other.